Looking for a good fine art printing provider? Many artists make their art prints in-house using a high-quality printer. But not me. I only have an old school cheapo printer at home, and that is definitely not gonna cut the mustard for fine art reproduction. I’m not ready to invest in a high-end printer yet, so I’ve been relying on professional printing services. I’ve considered using print on demand services (and I actually have tried selling on one of the platforms), and although there are many pros for using those services, like not having an upfront cost to have an inventory, it’s a little harder to control your customer experience. Although you have to make an investment up front, I like being able to build a relationship with my customers directly. I’ve worked with a few different companies in the past but was never quite happy with any of them for one reason or another. I needed to find a professional and reliable fine art print shop who can offer good quality giclee prints with reasonable price points and a good customer service. 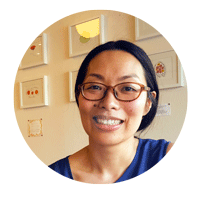 After spending many hours researching, both locally and nationally, I found FinerWorks. FinerWorks is a fine art and photography printing company based in San Antonio, TX. When I read the information on their website, their services seemed to match what I was looking for. So, I ordered a few giclee prints to try out and was impressed with the quality of their products. And I haven’t looked back ever since! I wanted to tell you about them in case you’re looking for a good fine art printing company, too. Read on and learn why I recommend them! I’ve used their Fine Art Paper Velvet and Premium Giclee Paper. They’re both great for the kind of artwork I create. I like the velvety texture of the Fine Art Paper Velvet, and it works really well with my line art work. I particularly enjoy how the black turns out so rich on this paper. The black comes out super warm and rich on Fine Art Paper Velvet. 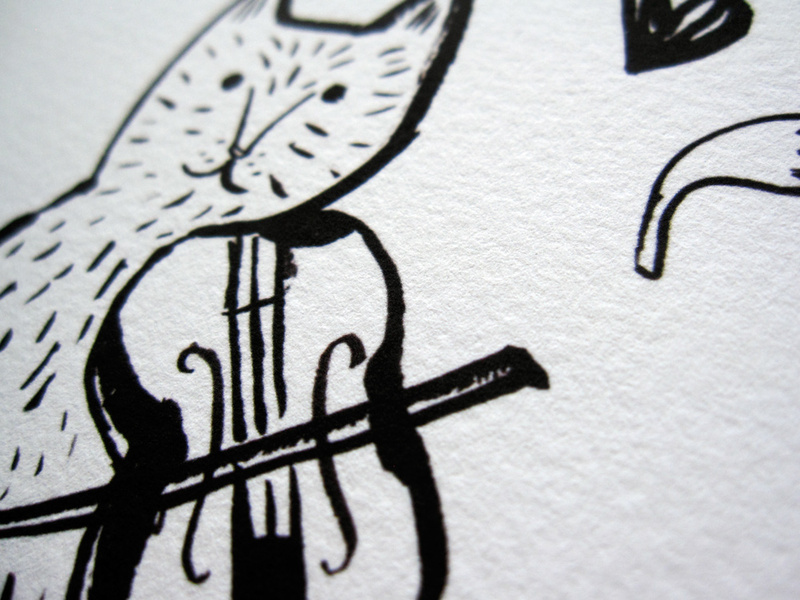 It was perfect choice for my Cat Violinist sumi ink drawing. 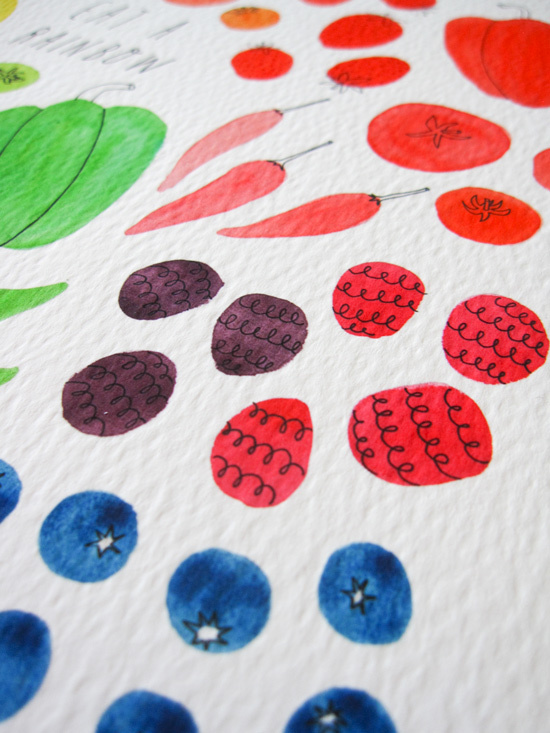 I just tried their Premium Giclee Paper for the first time for my Eat a Rainbow Collection and absolutely loved it. It’s got more distinct texture compared to the first and creates a very nice look for my watercolor art. 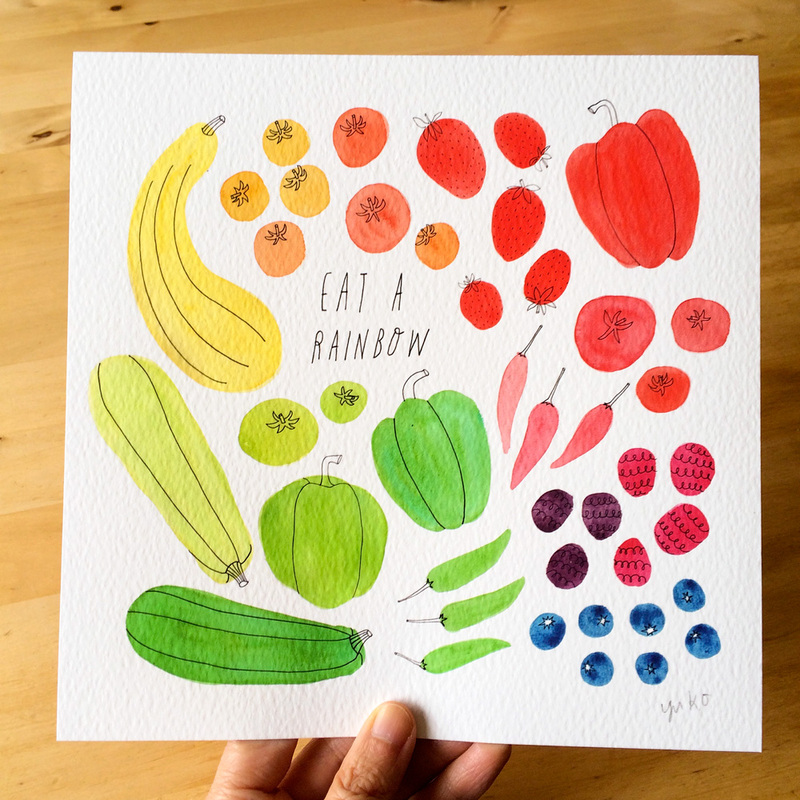 Eat a Rainbow Giclee Print on Premuim Giclee Paper. Love the texture! They offer a sample starter kit so you can see the actual papers they use. It also comes with a $20 gift card, which is nice 🙂 You can order it here if you’d like! I’m no tech wiz. I don’t really understand the details of how giclee printing works and why certain printers/inks are better. It definitely shows in their work, and I appreciate not having to worry about that stuff! When I sell my art prints to my customers, I can rest assured that I’m offering a top-notch products that are going to look great for a long time! They have a pretty quick turnaround time for production (typically within 3 business days, I think), so I don’t have to wait forever to receive my prints. As much as I try to support my local business, I also don’t hate getting my prints shipped to my house. It saves me my precious time for sure! I’ve always gotten a quick and courteous response from their customer service team as well when I needed help. 4. Great price points even if you place a small order. Since I don’t have a ton of money to invest in a huge inventory at this point, it was important for me to find a printer who doesn’t require a certain minimum order or charge a lot for smaller orders. Of course, the unit price gets better if you order more, but I find their price points to be still pretty economical even if you order 10 or fewer prints. Their shipping is flat rate (depending on the size and kinds of products), so it’s easy for me to budget for my order as well. If you’re in the market for a good fine art print shop, give them a try! Thanks for your question! I don’t feel like I spend that much time packaging – it might be different if I was getting lots of orders every day, but I’m not there yet… 😀 and I totally agree that their packaging for flat prints is not super attractive…their drop ship packaging is the same as you order prints for yourself. I’d much rather package it nicely with my personal touch as much as I can even if that means I need to keep a small inventory at home. Thanks, that’s good to know. I may start out doing my own packaging, and then if I feel like it’s too much to handle I can switch to drop shipping.